The stunning Langtang region boasts over 25 percent forest, including oak, maple and pine. Yet Langtang is most famous for its numerous rhododendrons, the national flower of Nepal. When in bloom in Spring, they’re as magnificent as any you’ll see elsewhere in the Himalaya. 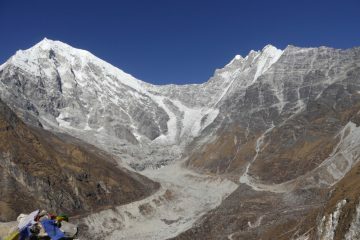 Definitely a good reason to choose one of the treks in Langtang in Springtime! Langtang is a quieter region of Nepal with less trekkers. So, if you want to avoid the really popular trails but still have an incredible Himalayan experience, we guarantee Langtang won’t disappoint! Areas of Langtang were devastated in the 2015 earthquake. The region suffered great loss. But four years later, Langtang is well and truly back on the tourist trail and is gaining popularity. Home to the sacred Gosaikunda Lakes, the highland villages of Helambu, and the Tamang Heritage Trail. There are many reasons to choose one of the treks in Langtang. Langtang is one of our personal favourites and not far from our founder Krishna’s village – in fact he can see Langtang Lirung (7,227m/23,711ft) from his doorstep! We’d love to share the spectacular Langtang Valley with you. Read this client interview about the Langtang Valley Trek, or just get in touch for a quote! The Langtang Valley trek in Nepal ticks so many boxes! Being fairly short, it’s perfect for beginners or those with less time for trekking. Trek through forests rich with flora and fauna including masses of rhododendrons (in full bloom in Spring), and spot exotic birds and monkeys! Relish the magic moment when you leave the jungle and step into the wide open space of the beautiful Langtang Valley! Then witness the enormity of the Himalaya when you spot Langtang Lirung (7,227m/23,711ft) for the first time! The highlight of our trek – we summit Kyanjin-Ri (4,773m/15,659ft) and enjoy one of the most spectacular 360° views! There are so many options for trekking in stunning Langtang. Ask us about the sacred Gosaikunda Lakes, the highland villages of Helambu, and the Tamang Heritage Trail, to name but a few! Or let us help you arrange a trek that includes all of these amazing trails!